After months of planning, Day 1 is finally in the books as we cycled 36 miles to Monroe, WA. It has been a fun but at the same time hectic last couple of days. It was great getting to finally meet the awesome group of riders that we have this year but at the same time things were crazy as we were scrambling around to get a van and trailer. So getting back on the bike and just enjoying the beautiful country side of Washington was much needed! The day started off with the group splitting up to attend two different church services at the place we were staying. Afterwards we had a fantastic potluck meal provided by University Christian Church (UCC) in which we were able to get to know some of the congregation and tell them about the Fuller Center and why we are riding this summer. I also want to mention that our overall stay at UCC was great and all the people we met were very welcoming, it was a great place to have orientation and start the ride! After the meal and presentation it was time to get things ready for the first ride of the summer. We had a short send-off ceremony in which Pastor Janetta of UCC said a few words, we got our first of many Oyees in and then it was off to Monroe, WA! It was great seeing everyone out on their bikes and even better seeing the long line of orange jerseys traveling down the road. With so many riders, plus a tall bike and tandem, it will be tough for people not to notice us as we go through towns this year. Speaking of the tandem many of you might not know that since Krystal’s bike was cracked in the accident. Her and her husband Michael bought a tandem and will be riding that this summer, talk about a one of a kind honeymoon! Overall the ride went smooth and it was a beautiful ride with the Cascade Mountains in the background. 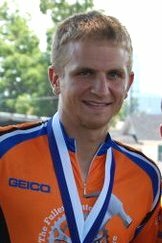 And in case you were wondering the rider with the first flat tire of the year was none other than the FCBA founder Ryan Iafigliola! The best part of the day might have been when we arrived at First Baptist church of Monroe who had the doors open and the wonderful scent of dinner being made floating in the air. I would like to thank Pastor Dan McMillian for opening up the church for us to stay with them and I would like to thank the ladies from the church who cooked a phenomenal meal for us! It was great to finally get this trip started and I’m looking forward to what this summer has in store for us. I know that personally it will be full of challenging moments in which I will really grow in my faith but at the same time there will be many moments of joy that will make this trip one that I will remember for the rest of my life! But then again at the end of the day this trip isn’t about me or about cycling it is about something greater, it is about serving the many people out there who are in need of a simple and decent home. And Tom, you are in our thoughts and prayers, I can’t wait for when you join us again in Denver! So glad the ride has officially started! Thank you, UCC, for taking care of the riders and thank you, First Baptist, for feeding the hungry cyclists after their first day! Not surprising that "Wrong Way Ryan" got the first flat. Keep an eye on him and make sure he stays on the planned route, though, or he might be the the first to get lost too! Stay safe, get some rest, and keep blogging so all of us back home can keep up with all of your adventures! I’m glad that you guys have gotten off to a good start! Great blog, Allen. Be safe. I wish God’s blessings upon each one of you as you give of yourselves for others! We’re all so proud of you, Allen. You’ve shown tremendous grace under very difficult circumstances. We are grateful for your leadership and all you’ve done to make this ride happen. Consider this a big hug from the entire Fuller team. Oyee Allen!!! So happy you are on the road. Did I hear you had snow yesterday? Safe travels. Thanks for what you are doing.